Bloomberg Terminal Training. Sign up now! In the library we get asked all year round when training sessions for Bloomberg Terminal’s are. The answer is always at the beginning of the year. This year, they are so popular, they have added extra sessions! Please see the dates and times below. Be sure to follow the link at the end to register. Trust me, this is one training session you do not want to miss! All sessions will be held at the Business Library. This entry was posted in Libraries, MA Students, Master's Projects & Theses, MS Students, PhD Students, Workshops & Training on September 28, 2016 by Tracy. DIY Research Series – Get the most out of your research! Though we know your time here at the J-School is short and packed, these workshops are something that you can work into your schedule to help you while you are here at Columbia and beyond! Check them out and sign up for the ones you can. We want to make sure you have all the tools you need to be successful! Build skills on how to design and conduct your own research studies! Learn how to translate a research question into a research study. Find documentation on how to conduct different kinds of research analysis, and get up to speed quickly with different methods to aid you in your research. Discover free and open data – from government agencies and other organizations – that you can use in your research immediately to do analysis and visualizations. Open data portals, data scraping, FOIA requests, and open data issues will be discussed. Understand how to collect data on individual/group activities and social interactions through ethnographic fieldwork and participant-observation. Methodological strengths, limitations, and documenting fieldnotes will be discussed. 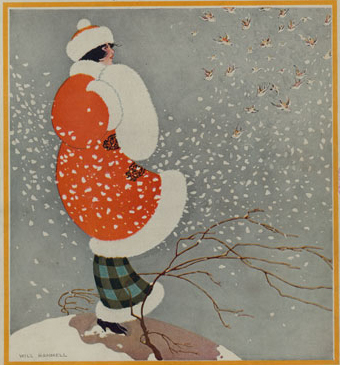 This entry was posted in Events, Libraries, MA Students, Master's Projects & Theses, Media Studies, MS Students, PhD Students, Workshops & Training on September 27, 2016 by Tracy. Map Club, learn how to make amazing maps! This entry was posted in Libraries, MA Students, Master's Projects & Theses, Media Studies, MS Students on September 19, 2016 by Tracy. Are you interested in the types of bias that exist in society? Then this group is for you! 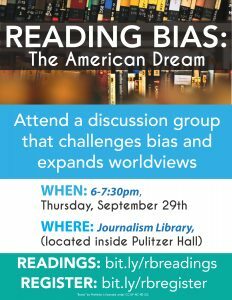 Hosted by our libraries this semester the Reading Bias group will consist of interactive discussions that explore biases, assumptions, and worldviews inherent in society via texts, e.g. articles, archives, data, and code. Readings are shared in advance to help facilitate discussions. 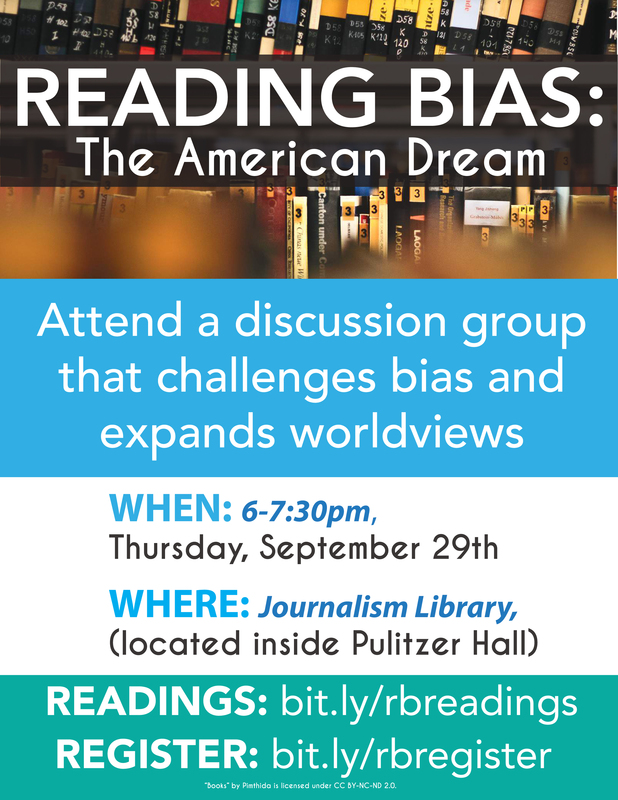 The first discussion is on Sept. 29, 6pm in the Journalism Library. This entry was posted in Libraries, MA Students, Media Studies, MS Students on September 19, 2016 by Tracy. Come by and see us during these hours, or feel to email any time. This entry was posted in Libraries on August 29, 2016 by Tracy. Hello, welcome, and congratulations to all the new students! I hope you are enjoying your week of orientation. We here at the library are so excited to get to know you all throughout the year. 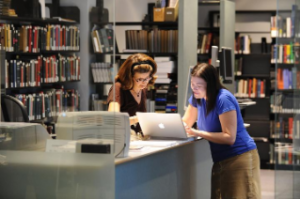 The library is located in the Stabile Student Center and to the left (big glass room, can’t miss us). Feel free to stop by, get to know us, see the space, and look at some Masters Projects from previous years. Then, starting in September, we will be open longer hours to help you make the most of your time here. This entry was posted in Libraries on August 3, 2016 by Tracy.